A year ago I moved all my websites to AWS using the free tier, using an EC2 t2.micro and the RDS relational database service. Now that my year of free tier is up I’d like to reduce my costs. I want to migrate from RDS to MySQL on EC2. 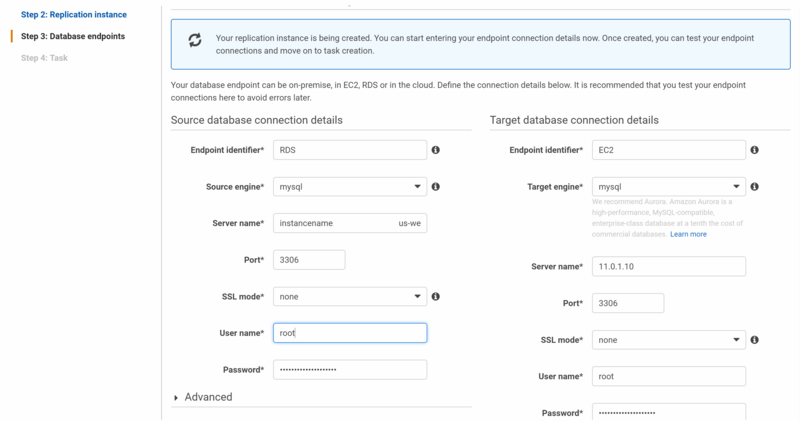 Moving MySQL from RDS to the EC2 instance using the AWS Database Migration Service is fairly straightforward, as described below. HOWEVER (and it is a very big however) the DMS doesn’t copy indexes or properties, so it actually makes a massive mess that takes a heck of a long time to clean up. So while it will work this way, I STRONGLY encourage people to use a different method for migration – I would do a dump using the mysql tool then import that into MySQL running on the EC2 instance. Once I finished my EC2 install of MySQL I realised the default mysql-server package on AWS is MySQL 5.5. This lacks some features I need, such as “DEFAULT CURRENT_TIMESTAMP”, so I have to go through some pain to upgrade to MySQL 5.6. I looked at MySQL 5.7, and it’s quite easy to install using the official MySQL community repository, but I expect it would bring additional trouble and effort, so I didn’t bother with it for now. Once this was all done I changed my EC2 instance from an t2.micro to an t2.nano, which reduces available CPU and RAM by half. This runs MySQL in a low memory configuration, PHP 5.6, and Nginx very well. It can use a full Xeon core as required, eating into CPU credits, so it’s as fast as the t2.micro – just not for as long. In terms of RAM it’s all used but of that 210MB is cached, which tells me that it’s really only using 293MB of RAM. You can see how to upgrade from MySQL 5.5 to 5.6 on Amazon Linux below. Whichever version of MySQL you use, here’s what you do next to set up MySQL to run and set up admin users. This is the recommended method of migrating databases between servers. Run this command to export the database contents. Run the following commands to log into MySQL, create a new database, and import the dump you created. That’s it. Quick and simple. Once again I need to say THIS IS A TERRIBLE WAY TO MIGRATE WORDPRESS. It doesn’t migrate secondary indexes, stored procedures, or auto_increment values, and fixing this took me about half a day on my installs. You can see how to fix WordPress auto_increment fields and indexes here. The DMS creates a migration instance that does the actual migration for you. You need to ensure this instance is in a VPC and subnet that can access both the RDS instance and the EC2 instance. You can find more detail about this here. Start the database migration service, which for me is at this URL and step through the first obvious screen. Create the replication instance – I used a t2.micro as I have small databases. Set up what you want migrated. Unfortunately at this point when I was trying to create screenshots I hit the wrong button and the DMS wizard exited, so I don’t have a screenshot here. It’s fairly simpleto configure, but note that you have to manually start the migration once it’s setup. All in all I found the DMS very easy to configure and run, but sadly lacking in areas that only became obvious once the migration was complete and RDS was turned off. Better testing would’ve uncovered these issues earlier. Of course I have an RDS snapshot but since the data has changed it’s too late to do this again. I could dump the database schema then import data manually, and that’s what I’ll probably do at some point. Important note: make sure after you’re done that you delete your tasks, endpoints, and replication instances to avoid additional costs. You’ll also want to close any security group or NACL ports you opened for the migration. The following are the commands I used to upgrade from MySQL 5.5 to MySQL 5.6 on my EC2 amazon linux instance.